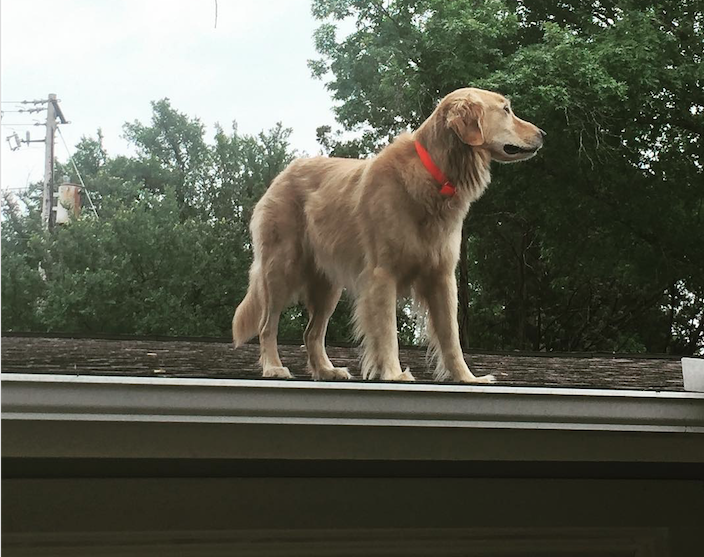 Some dogs stare out the window, others keep watch in their backyard, but this golden retriever isn't like most dogs — he prefers the roof. The 5-year-old dog named Huckleberry can be spotted several times a day casually sitting on his family's rooftop. You can't miss him. "He likes to sit up there and watch the cars and passersby," the dog's owner, Allie Lindenmuth, told CBS News. "He loves to bark and say hello!" When Lindenmuth and her husband, Justin, moved into their house in Austin, Texas, about four and a half years ago, they noticed there was only about a 3-foot clearance between a hill in their backyard and the roof. They wondered if their intelligent puppy would ever figure it out. It only took him six months. "He now goes up every single time we let him outside," Lindenmuth said. In fact, the golden retriever was spotted on the roof so frequently, the Lindenmuths were receiving calls six to eight times a week from people informing them of his whereabouts. And every time, they had to explain his roof-jumping routine. "It is pretty obvious when he is up there... it is very loud," Lindenmuth joked. Instead of explaining the dog's unusual habit to every concerned individual, the Lindenmuths decided to put up a sign. "Don't be alarmed!!!" the poster read, along with a photo of Huckleberry standing on the roof. "We appreciate your concern but please do not knock on our door... we know he's up there!" The sign has been hanging outside of their front door for about two years now. In order to ensure the dog's safety, Lindenmuth says Huckleberry is never allowed outside when his owners aren't home or if the weather is bad. They're even considering building him a ramp to protect his hips. The dog may be getting older, but he's still full of energy, Lindenmuth says. "Huck still acts like a puppy 5 years in and isn't showing any signs of slowing down," she added. "He is a wild one." The neighborhood has now come to know and love their local "roof dog." "One time we were working on landscaping in the front yard and this car kept going by and slowing down in front of the house," Lindenmuth said. "We're fairly used to that but they did it like 10 times and Huck was inside. Finally, they pull up to the driveway and the driver said, 'My 85-year-old mother is in town and I told her about your roof dog. Could you show him to her?'" The Lindenmuths even created an Instagram account for Huckleberry to give updates on his adventures. The account has already grown to more than 20,000 followers since it was launched last week. "We are thrilled with the joy this has brought to lots of people," Lindenmuth said. "We've definitely noticed a little bit more pep in Huck's step since this all started."